The daughter of former Egyptian President claims the televised footage showing the ousted leader in prison is not of her father. The daughter of former Egyptian President Mohammed Morsi is claiming that she is “certain” that the televised footage showing the ousted leader in prison is not of her father, Al Arabiya reports. According to the report, the daughter Alshymaa shared two pictures of Morsi on her Facebook page, one while he was president and the other of him during his trial. She claimed in a comment that the one in prison does not resemble her father. Egypt’s state television regularly airs footage of the former Islamist leader during his trails inside a cage in a makeshift courtroom in Cairo. “The one who is on the right side of the picture is my father, the one on the left is not him I’m certain. Check out well, it’s not him,” her Facebook post said, according to Al Arabiya. 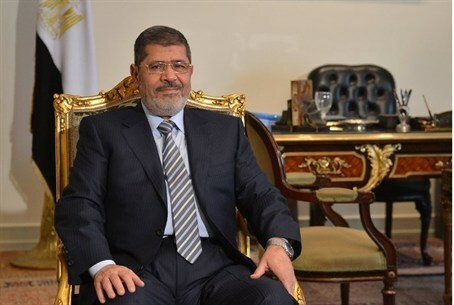 Morsi, who was ousted by the military in July, is currently on trial in several cases. In one trial he is being accused of inciting the killings of opposition protesters outside the presidential palace in December 2012. Since Morsi’s ouster, more than 1,400 people have died in street clashes and thousands have been imprisoned.